Why Is The American Kennel Club Supporting The Worst Puppy Mills? Wild Bill once had the honor of being named "Best in Show." The Australian Cattle Dog competed in American Kennel Club events and won ribbons for his good looks. But then he got some gray on his muzzle, and fame faded. It wasn't long before local law enforcement came across Wild Bill, starving in a filthy, rusted crate in inches of feces-infested water, with more than 60 other dogs in a Mississippi puppy mill. He had gone from the loftiest heights in the show world literally to the bottom of the barrel. And if that wasn't bad enough, an AKC inspector saw it all – and handed the kennel a clean inspection report.The Pearl River County SPCA rescued Wild Bill and more than 60 other dogs from Bleu Moon Cattle Dogs last October. The owner of Bleu Moon Cattle Dogs pleaded guilty to animal cruelty charges in December. But there is more than one guilty party involved in this riches-to-rags story. The fact that an AKC inspector could go on the property just days before Wild Bill and the other dogs were found in squalor and hand the owner's facility a favorable review tells us so much about what's wrong with the AKC, and with some corners of the dog fancy world. 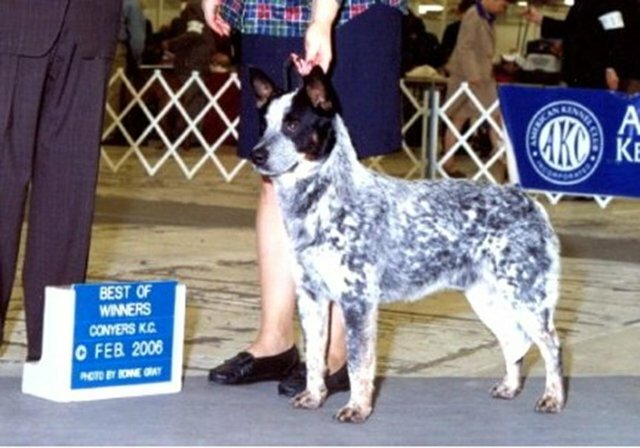 In fact, at one point, the AKC granted its highest honor, the Breeder of Merit status, to the owner of Bleu Moon Cattle Dogs. It seems so counterintuitive, and even bizarre, but there is an unmistakable, amply documented trail of evidence that AKC regularly fights laws designed to crack down on puppy mills, in addition to conducting private inspections and giving its approval to mills like Bleu Moon Cattle Dogs. In 2012, we released a report exposing the fact that the AKC had opposed more than 80 laws designed to protect puppy mill dogs from cruelty; today that number has climbed to more than 150, showing that the AKC has doubled down on its lobbying to protect mills. The AKC's political action committee has funneled thousands of dollars to politicians who oppose animal welfare reform, including Rep. Steve King (R-Iowa). Two of the AKC's "elite" Breeders of Merit have been found just over the past few months to be keeping their dogs in filthy conditions, and one has pleaded guilty to animal cruelty charges. Both closed down just weeks after passing their AKC inspections.So much of this boils down to money. The AKC is sustained by fees breeders pay to register puppies. The more dogs registered with the AKC, the more revenue the organization gets. The organization's PAC then fights many laws that would protect dogs. Some of the worst facilities wave around their AKC credentials like a badge of honor, and draw consumers away from better sources of dogs, such as animal shelters and rescue groups and responsible breeders. When the AKC fights bills that would protect dogs and do no harm to responsible breeders, it damages the reputation of breeding as a whole and hurts the very dogs it claims to value.